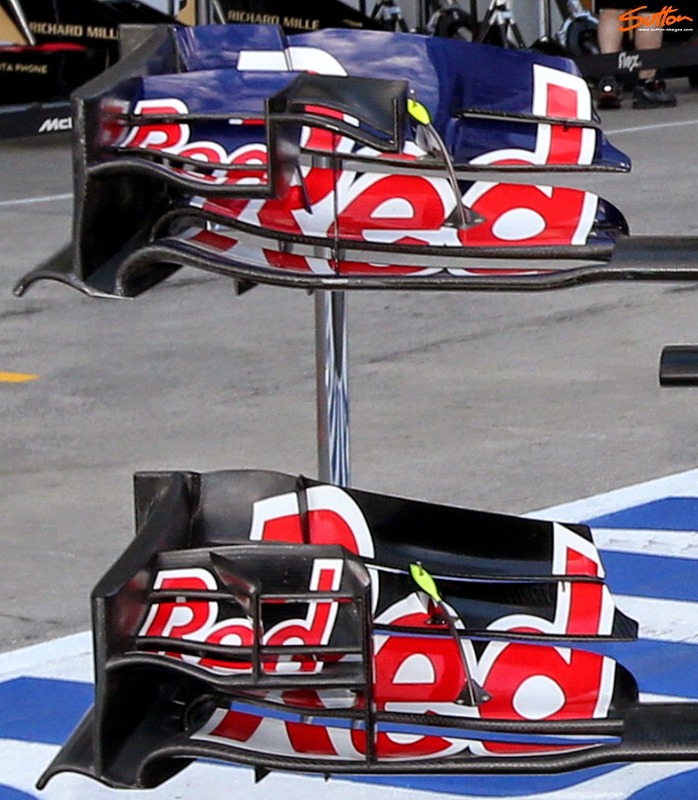 The sister Red Bull team arrived at the companies circuit in Austria looking to improve performance with a new front wing. The original DNA remains but several key changes have been made to affect how the wing performs. Teams are of course still gaining performance based on the reduction of the Front Wings width in 2014 (down to 1650mm from 1800mm, or 75mm either side), which of course affects how the airflow is turned around the front wheels. The teams latest iteration (bottom) sees the main cascades increased significantly in width, with the inner most section, outwardly angled. This along with the addition of another outwardly angled vertical fin placed in the centre of the cascade, looks to push the airflow, up and around the front tyre. This is not only essential to the performance of the Front Wing but will also have an effect further down the car, as the tyres wake begins to impact the floor. Being able to control the way in which the air flows around the front tyre also leads to more control further downstream. The team have also changed tact when it comes to the design of their flaps, with the older specification sporting a top flap that was only split a short way along its length. However the new wing features a twin top flap arrangement allowing the wing a wider operating window before flow starts to separate. This splitting of the upper flap allows differing angles of attack to be initially set, giving the team license to change the flaps height, camber, chord and/or orientation.